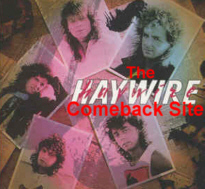 Welcome to The Haywire Comeback Site. This site is devoted to one of the most prolific rock groups from the East Coast, Haywire. Haywire was formed in Charlottetown, PEI, in the early 1980s, and had a lot of commercial success throughout the '80s and mid '90s. Haywire consists of: Paul MacAusland, Marvin Birt, Ronnie Switzer, David Rashed and Sean Kilbride. Want to book Haywire to play your venue? Contact their booking agent, Bernie Aubin via his Canadian Classic Rock website.